A cornerstone of America’s foundational narrative is that we are a nation of highly diverse immigrants simmering together in a mythical melting pot to cook up our trademark independent, industrious, upwardly mobile citizen in this land of individual opportunity. Yet America’s borders have never been totally open with a welcome mat for all. As early as 1645, the entry of paupers was prohibited and by the beginning of the last century federal government regulations were in place to filter out undesirable migrants such as convicts, prostitutes, the insane, political radicals, tuberculars, and almost anybody born in Asia. Under globalization, American anxieties about maintaining even selectively open borders have been escalating as visible minorities have become the dominant faces in many parts of the country, and native-born workers worry about the cost in terms of both taxes and jobs. Immigration reform has emerged as perhaps the most contentious and emotionally charged political issue of our time, with increasingly protectionist and xenophobic overtones as homeland security, class, regional disparities, religion, and race color the discourse. 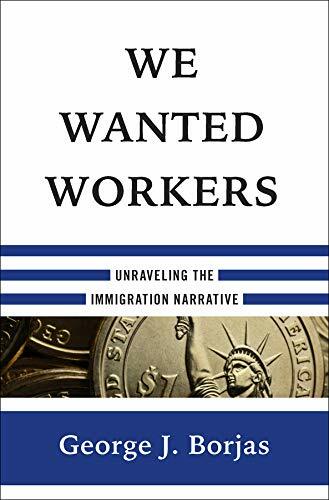 At this juncture, leading American immigration economist George J. Borjas has come out with the very timely and necessary book We Wanted Workers: Unraveling the Immigration Narrative. Borjas challenges the master narrative that immigration is universally beneficial. He maintains that immigrants cannot be regarded merely as an import consignment of much-needed workers to fill predetermined slots along the proverbial assembly line. Borjas criticizes the dominant economic paradigm for the fallacy of treating immigrants as solely a collection of labor inputs. The Cuban enclaves in Miami provided a supportive safety net for the new migrants, cementing in Borjas an affectionate perspective on immigrant communities but not convincing him of the inevitability of assimilation under the melting pot model. Instead, he became interested in the variations between different waves of immigration over time according to the demographic composition and earning capabilities of each wave, as different groups of migrants bring different skills and face different structural conditions. Just because the Ellis Island era of European-dominated immigrants flourished on their adopted soil in short order contributing to surging national productivity does not mean that this will hold true for subsequently waves. Borjas challenges this misguided idea by taking readers on a detailed historical tour of America’s immigration history and contemporary policy. After reviewing the real-world obstacles to imagining John Lennon’s utopia of a world without countries in terms of the removal of immigration restrictions on global labor, he guides us through chapters on immigrant self-selection, economic assimilation, the melting pot, labor market impact, economic benefits, and fiscal impact. In each chapter, Borjas presents in non-technical, almost conversational language his unpacking of the conceptual baggage of other economists and the findings of his own painstaking research on the economic modeling of immigrant labor performance and the statistical assumptions on which these are based. His childhood experience in revolutionary school inculcated in him both an intense dislike of ideological arguments and an ingrained skepticism of expert opinion. Consequently, he is careful to show how the voluminous social science literature on immigration is vulnerable to ideologically framed paradigms such that data can be manipulated to lead to desired conclusions. Sloppy data collection, skewed data analysis, and biased electoral politics reinforce the belief that the measured impact of immigration is good for everyone. Instead, Borjas presents a counter narrative to both this prevailing academic gnosis and to the anti-immigration camp. Instead of asking what we owe immigrants, he asks what are we likely to get in return? He concludes that immigration has not affected the average American all that much, but it has created winners and losers depending on the specific native populations, the different kinds of immigrants, and the different times thrown into the mix. “It depends.” And the only sustained winners in recent waves appear to be the firms which employ the relatively small numbers of highly skilled professional immigrants and the low-skilled migrant majority. Borjas leaves the answer to this question up to us, pointing out the implications of the various options we could pursue. But for him personally, a United States that continues to offer new hope and a fresh start to the world’s less fortunate is the kind of country he wants to live in. The key words here are “secure our borders . . . responsibly.” There is no hint of racism and xenophobia in Borja’s balanced assessment based on level-headed, lucid, and transparent calculations and judgments. It is neither feasible nor desirable to build walls around our entire country with drawbridges that can be lowered and raised to police traffic. But the problems attendant on admitting large numbers of unassimilated minorities and refugees require much more careful study than we have been allowing. We Wanted Workers is essential reading for everyone concerned about how we can retain America’s historic role as a refuge for some of the world’s poor and oppressed as well as those simply hungry for the opportunities that our country has to offer. In particular, it should be read by politicians, who all too often seem to speak from opportunism or ideology rather than from an informed perspective. The book is not a quick read, however. Though written in plain language and not demanding advanced mathematical skills it does require careful study of some uncomplicated tables and charts. Borjas is, no doubt, a popular lecturer as a low-jargon, coherent academic who positions his material effectively around his own life experiences. But he is an economist and obviously fascinated by number crunching which is not everybody’s cup of tea. After a while, examples such as the globalized production of the proverbial widget and streets littered with dollar bills get tiring!